I am continuing my quest to make kanji learning fun and enjoyable for my kids. I stumbled upon a super simple idea that Austin and Ethan seem to really like. 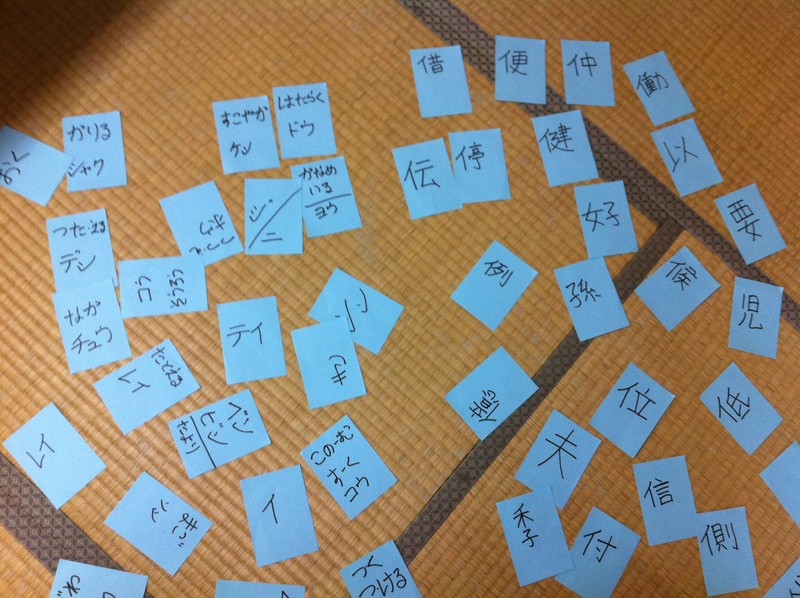 When given the choice of how to practice kanji at home, this is currently the method they always choose. They have a kanji workbook from UICS (their Japanese school) that they are going through. After they complete a page in their workbook, I use a memo pad and magic marker to write the kanji on one piece of paper and the readings for that kanji on another. 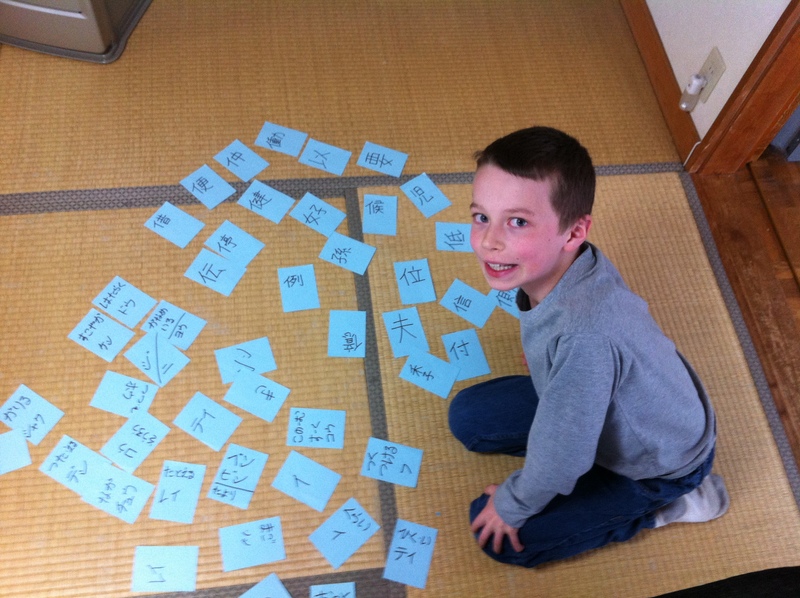 Instead of playing concentration with those kanji “cards” (which would take too long), I have the kids separate the kanjis from the readings and then lay the cards all out on the floor face up so that they can see both the kanji and the readings. The boys then go through and match the readings with the kanjis. Once they have paired them all, I go through and check to make sure the pairings were correct. If they were, they are done. If there were several wrong or if I noticed that they seemed like there were several that they were unsure of when pairing the cards, then I will have them separate them again and play the kanji matching game one more time to really solidify the kanji and their readings in their minds. So far, this has been an enjoyable, relatively painless way for them to begin instantly recognizing the kanji they are studying and I have been impressed at how they are able to rattle off all the readings of the kanjis in each set I have made for them. The standard way to study kanji in Japan is just to write it a million times. But this gets old fast for Austin and Ethan and I have noticed that they can copy the kanji ten times on “auto-pilot mode” but then not be able to remember the reading or how to write it if I take the book away and quiz them on it. So, this game seems to be an effective way to help them keep the kanji in their long-term memory after they have done the traditional writing of the kanji in their workbooks. Another fun way the boys sometimes practice kanji is through iPad apps. There’s a series in the App Store now called Kanji Yubi Doriru (which means drills for writing kanji on the screen with your finger) that covers the kanji learned in elementary school from first through sixth grade. I got the free version of the second grade kanji app for Ethan last year and he liked it, so I upgraded that one and purchased the rest in the series so that Austin and Ethan (and later Katie) could use them to practice kanji when they didn’t feel like writing in a workbook. I also have a free app called Kanji Ninja that quizzes kids on all 1006 of the elementary school kanji, though we haven’t used this one as much so far. There’s just something about getting to use a screen for homeschool that ignites a spark of interest in the subject, especially when it’s a subject they aren’t naturally all that excited about to begin with. The Yubi Doriru apps have a place for practicing the kanji on the iPad screen and also quizzes for how to write and read the kanji. To see part one of this post, go here. 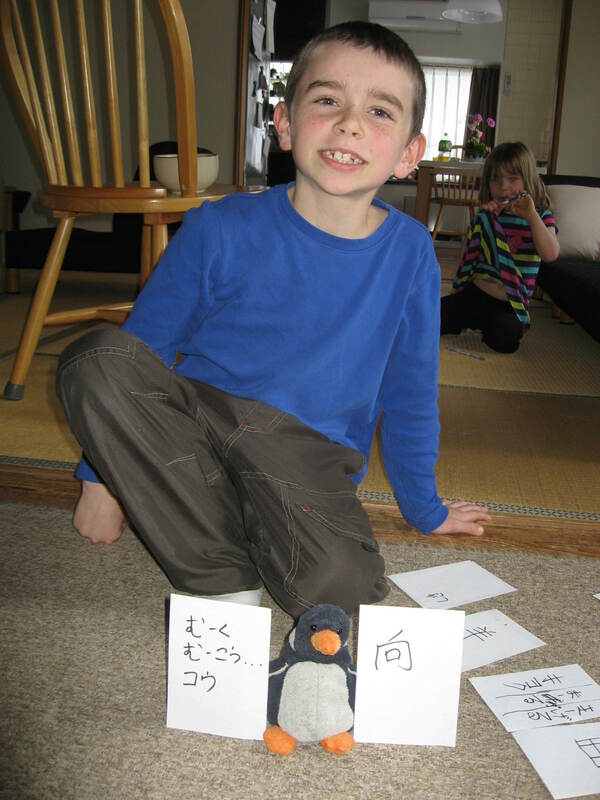 Whenever we can add even a little bit of “fun factor” to the learning of kanji (or any other subject) the boys are very responsive and are much more whole-hearted in their studies. But, isn’t that true for everyone? Don’t we all prefer to do something or learn something when it’s fun instead of boring? I recently came across this YouTube video by the Volkswagon company that illustrates this truth in an interesting way. The company showed how they could get more commuters in a Swedish subway station to take the stairs instead of the escalator by turning the stairs into a giant piano. 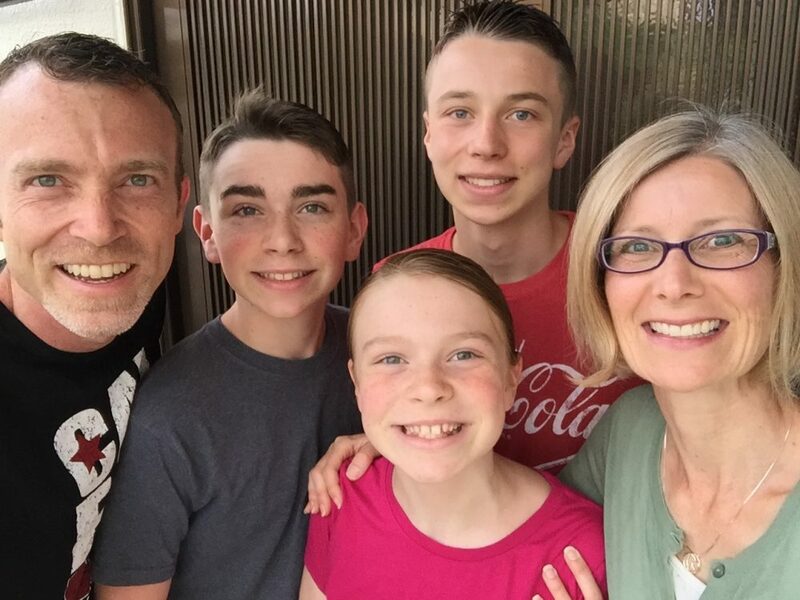 Volkswagon calls this “Fun Theory.” I first saw this Volkswagon video and read an inspiring post about incorporating Fun Theory into our homeschooling over at this blog by a lady named Laura Grace Weldon. I really like her blog and plan to follow her posts for more inspiration in my own homeschooling. Good job, Pengy! You made a pair! A few of the third grade kanji cards. 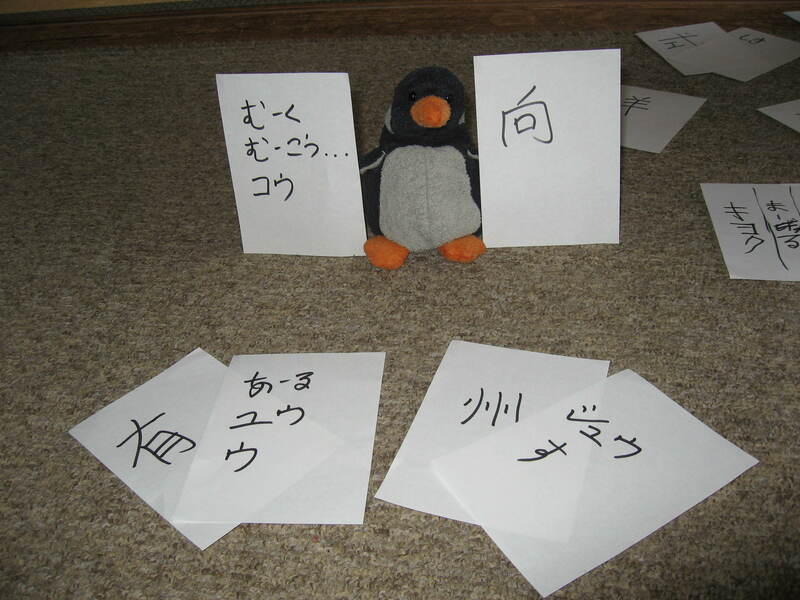 Ethan and “Pengy the Penquin” worked as a team to play Ethan’s matching game with the third grade kanji. 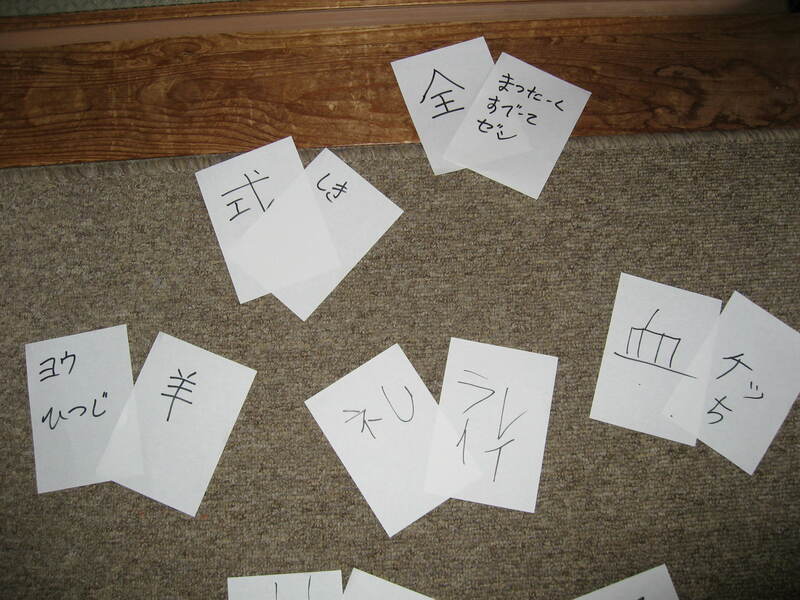 Some of the fourth grade kanji cards, waiting to be matched. Austin reviewing his fourth grade kanji.